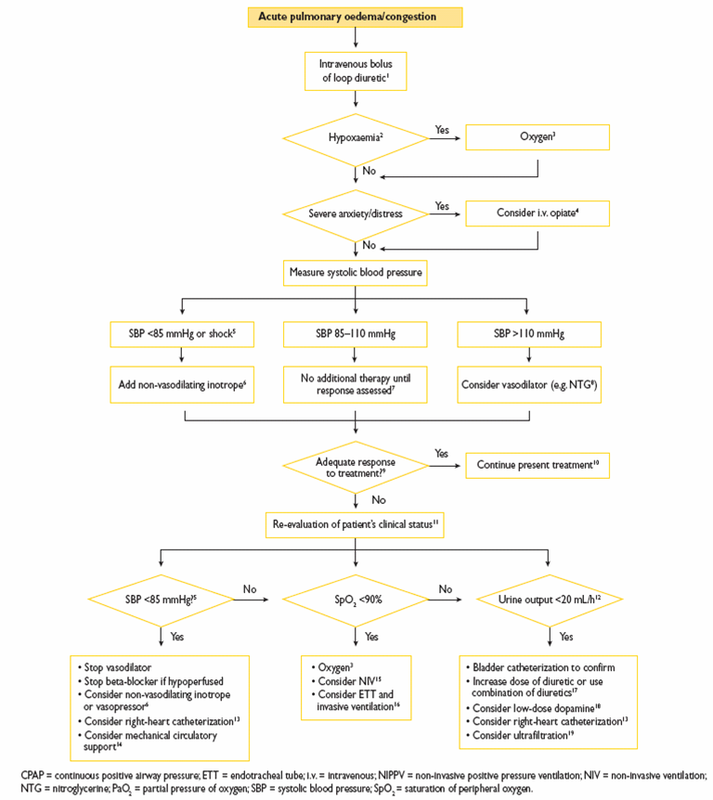 FINALLY….Where you have all been waithing for the last couple of months….FLIPPING THE GUIDELINE OF THE SYMPATHETIC CRASHING ACUTE PULMONARY EDEMA (SCAPE)! (In the Netherlands we call this “cardiac asthma” by the way.) We started on december the 16th, 2012 and today, almost 3 months later, it is time to flip it! 1.) Diuretics and when hypoxic give O2. 4.) If good response  Continue treatment, if not, re-evaluate. ** Dosis NTG: Start with 200-400mcg/min for several minutes. If no improvement titrate upwards. When improving titrate down till 100mcg/min. 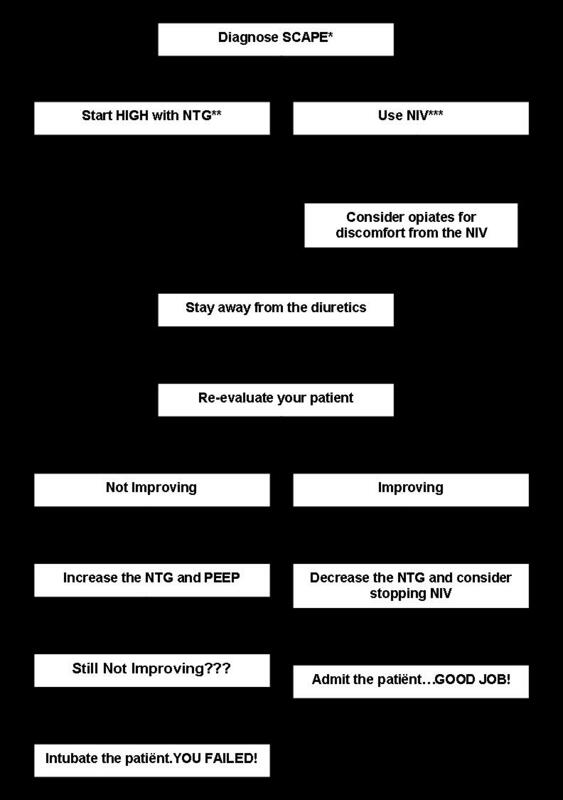 *** NIV: Start with 5cmH2O PEEP. If no improvement increase with steps up 3cmH2O quickly till 12 cm H2O PEEP. If you feel these doses of NTG is a lot….go to EMCrit and you will read that some folks started with NTG bolus of 2mg! A 67-year old man was brought in by ambulance to my ED with a severe case of SCAPE. They already had given him O2, lasix, morphine and NTG subligual, following their protocol. His medical history revealed (in short) ischemic cardiomyopathy, COPD, (mild) kidneyfailure, diabetes and severe obesity. He was >150kg by 1.90 mtr. Initially he had a BP of 210/150, Pulse of 115/min, RR of 33/min, SpO2 of 100% with NIV and no fever. His GCS was E2M5V2 and he was sweating profoundly. His hands were blue and cold of bad peripheral circulation. His initial arterial blood gas showed a pH of 7.11. Despite his bad appearance and low GCS we put him on NIV and gave him high dose of NTG. We started at 200mcg/min and after 5 minuten he was on 800mcg/min. He got this dose for 15 minuten, during which he improved, his blood pressure finally came down and he felt fine. His pH was now 7.31. If it wasn’t for EMDutch this patient would have probably been intubated in our hospital, which would not have been easy! The cool thing about this treatment is that treat your patient really fast and everybody in the hospital is talking about you….hopefully in a good way ;-)! Alright…so far for SCAPE! Next big topic will be pulmonary embolism, which is a topic I both love and hate because of all the controversie about this disease. Hope to seen you then! Remember…..this guideline is NOT an official guideline, just my opinion! Standard perfusor solution of GTN is 50mg/50ml = 1:1. Usually (in the old days) you would start at let’s say setting 1 (or 2). 1ml/hr = 1mg/hr = 1000mcg/hr = 16,7mcg/min. Now it takes your nurse a good 5-10mins to get this syringe and perfusor ready. If you give 2 sprays of GTN SL every 3 minutes, you give your patient 2x400mcg every 3 mins. That is 800/3=266mcg/min = 16mg/hr = perfusor setting 16ml/hr!!!. (OK, I know, SL is not as effective as IV, but hey, that’s a big difference in dosage 16 vs 266mcg/min!) So what we do with our old-school perfusor setting is more or less homeopathic. O, and how long do you think it will take the iv fluid to effectively enter the site of action in a perfusor setting of 1-2ml/hr…? So what we should do is: give 3mg boluses of IV GTN every 5mins (just purge that perfusor, and yes that is a whopping 600mcg/min! ), until you see BP going down and patient gets better (usually 2-3 boluses suffice). There is very little risk in overshoot as GTN has a very short halflife. So if BP gets too low, you just shut down the perfusor and wait. If patient improves after the boluses, set your perfusor to 6ml/hr (=100mcg/min) and wait. If symptoms improve, titrate down, if symptoms worsen, titrate up. Now the only thing I get kind of worried about is the SCAPE patient with a yet unknown significant aortic valve stenosis. We tend to not give those patients (high dose) GTN, or at least be very cautious with it. Anyone any comments on this one? I suppose if you stop the perfusor if your BP goes below 100syst. you should be fine? And here we go again: Egon, I know how you think about giving morphine to patients in resp. distress (don’t unless your goal is to euthanise them…) but interestingly you still included it in your -let’s say- concept guideline. I tend not to give it anymore (yes, nice discussions with the cardiology trainees) and indeed do high dose GTN and NIV. Hope this can get the discussion going in your hospital. Hi Sebastian….Great to see your comment since it was your idea about flipping the guideline if I am correct. I agree with first giving s.l. before you give NTG iv…but with the bolus of 3mg I have no experience and in our hospital it is still a bridge to far! 800mcg/min was already shocking over here, but very cool to do! About the aortic valve stenosis…we tend to be very cautious with it, but I don’t know if it will do much harm if you stop it in time when the BP goes down. Maybe somebody else knows that. I remember we have given it in a patient with SCAPE who later was shown to have an aortic valve stenosis. I can’t recall that there were any problems with the NTG. Only major complication I have seen from high dosing of NTG was in a patient with vena cava superior syndrome (which is very rare presenting like this, with no medical history). Her BP collapsed! About morphine you are correct! I never give it, but (following S. Weingart) you can give it for discomfort of the NIV….not as treatment of the pulmonary edema! Several guidelines say you can use nitroglycerin in case of SCAPE, just be cautious. You usually will hear a murmur in AoS, becoming louder with increasing severity (in contrast to mitral regurgitation). So if you hear a murmur be cautious. And … try to get/do an bedside ultrasound asap to see what causes the murmur. Another indication for emergency ultrasound!!! Thank you all for this very helpfull opinions!! I was wondering if you can compare the dosage of isosorbide dinitrate with nitroglycerin. Because in the literature isosorbide dinitrate is the medication the refere (the sources Sebastian used). Is it correct to use those dosages for nitroglycerin. I was not able to find this answer anywhere. Maybe you smart guys can help! This is the spray we use and the perfusor solution. It contains 3 NO-groups. There still is discussion about its metabolization, but it probably is converted into NO and glyceryl dinitrate (GDN). What happens to GDN afterwards, I cannot find. Isosorbide mononitrate (ISMN, monocedocard, promocard), only available as tablets for oral use, usually slow release for chronic use. So the real question is: is GTN really 1/3 more potent than its brother ISDN as it contains 3 NO-groups in stead of the 2 in ISDN? Anyone any comments to this one? Last week I used the 400mcg/min (=24ml/h of nitro 1mg=1ml) starting dose on a patient with pulmonary edema. The cardiology resident had started the drip @ 15mcg/min before that, but not much had happened. With 400mcg/min the systolic blood pressure dropped from 165 to 155. It then was increased to 666mcg/min (40ml/h), nothing happened. I than gave 3mg (=3ml) nitro bolus, then the BP dropped tot 120 systolic. I’ve had the same happen twice now. Started with high dose NTG-i.v., titrated further up, because the blood pressure didn’t drop. But in both cases the patient did started to feel better, before the blood pressure dropped, which it eventually did (because of the NTG or because of otherwise getting better resulting in less release of (nor)adrenalin?). As I recall one of the patients was on NIV, the other wasn’t (didn’t tolerate it). Can tachyfylaxis occur that fast in high-dose NTG??? Or are some patients NTG-refractory (dose dependant??)? ?